…According to the complaint, in November 2007, the landlord gave Nazor, who had lived in the building since 1983, and Mickle, whose arrival date is not specified, notice that he wanted them out. 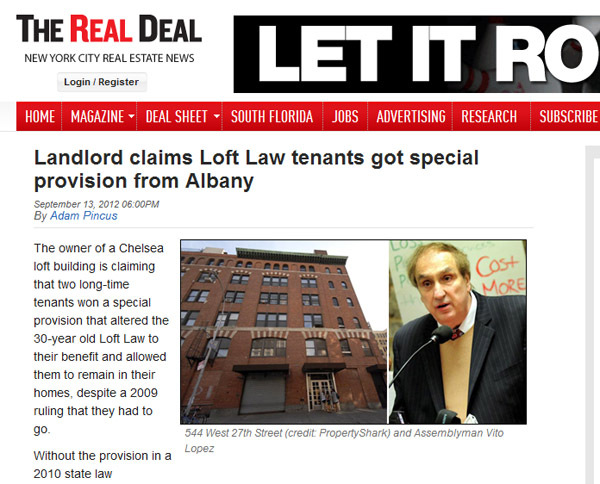 They refused, and so he filed a suit in January 2008 to evict them, and in December 2009, a judge said they had to go. They continued to battle in court, and then after the new carve out was passed in July 2010, they filed new papers supporting their right to stay. The law seeks “to convert a structure with only two residential units solely to benefit the individual tenant-defendants, tenants of the only one building in the only one unit in the entire city of New York which would possibly qualify,” the complaint says.